That was today. Monday was pulmonology day, the latest attempt to figure out why I grow so short of breath under exertion (and not in other contexts). First a set of basic spirometry tests, which taken together indicated that my lungs were fine (and that my asthma is indeed gone). Then the pulmonologist, who was sharp, engaged, and sympathetic. (But every specialist is a new experience, and their modes of interaction are really important, so confronting new one after new one after new one is exhausting.) He’d been through tons of reports from other doctors, admitted that I’d taken pretty much every kind of test there is, and that I seemed to be in pretty good shape, but asked me to do advanced spirometry tests, while he waited. What those showed was that they could reproduce the relevant effect by having me walk briskly through the halls of PAMF hooked up to a pulse oximeter. Well, you could hear me gasping for breath. Long story short, it’s still a mystery, but there are no medical threats looming over me, so I can just press on with life (with restrictions in the short term for my eye surgery). I note that the pulmonologist, Richard Chalker, ended up giving me an extra hour of his time, which is quite something. The rainbow thing. Early on, Kim and I noticed that Dr. Chalker’s ID badge had a rainbow band across the top, but we didn’t have time to ask about it. Today, we asked a nurse at the Surgery Center about it, and learned that the staff were encouraged to put the bands on their badges to communicate that PAMF values and welcomes all sorts of people. 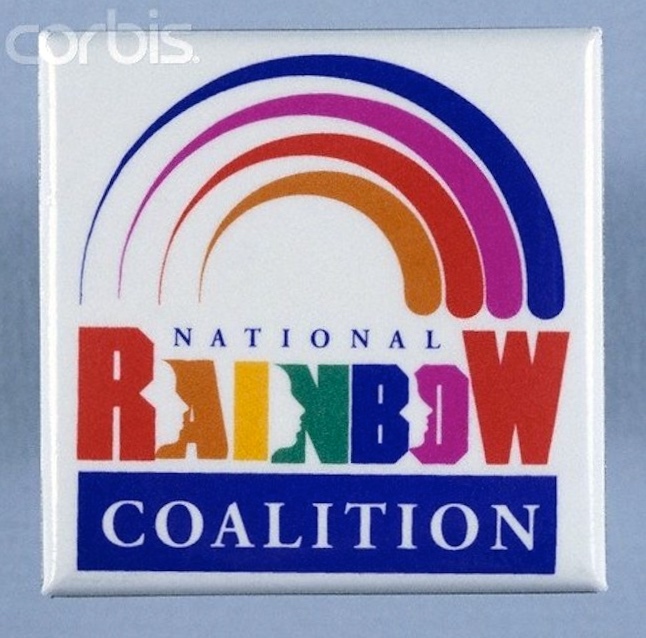 Think Jesse Jackson’s Rainbow Coalition of the 1980s, plus the rainbow Pride flag. The word RAINBOW has the 6 colors of the Pride flag, in spectral order (with magenta for violet/purple, and with red repeated for the W). The rainbow also comes in a very different 4-color version, also illustrated above: orange or yellow, red, magenta, blue. This entry was posted on September 27, 2017 at 6:23 pm and is filed under Language and medicine, Language and the body, My life, Rainbow, Signs and symbols. You can follow any responses to this entry through the RSS 2.0 feed. You can leave a response, or trackback from your own site. Thanks for your posting. Dr. Chalker is an excellent physician: patient, understanding, inclusive. And my husband! Possibly the greatest comment ever on this blog!